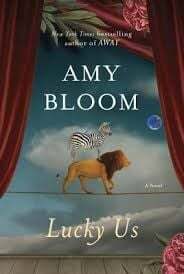 In "Lucky Us," the new novel by Amy Bloom, half-sisters Eva and Iris find themselves living together, suddenly, after Iris' mother dies, and Eva's mother inexplicably drops her off at her father's house, accompanied only by a suitcase. A very distinctive personality, Iris bosses around, but also shelters, her quiet new sister. After forming a quick bond, the girls abscond to Hollywood so Iris can pursue her nascent starlet dreams. The rest of the book traces their lives together and apart, and the interesting people who populate their world. Although "Lucky Us" is historical fiction set in familiar territory—old glamorous Hollywood, Broadway, post-World War II small-town America—it features a cast usually left out of the textbooks. Bloom has sought out characters marginalized for who they are (Iris, a lesbian, gets excommunicated from the movie biz), for who they might be (Gus is wrongly identified as a German spy), and for who they were (Iris and Eva's father hides his real identity until dementia reveals it). And then there is Reenie and Francisco and Clara, who all have roles to play. Each is memorable and indelible. All of these outcasts' lives essentially center on Eva, the brilliant but feckless heroine accustomed to picking up the remainders of everyone around her. At one point in the novel, Eva is talking with her father about Iris' current girlfriend. A natural raconteur (he "read books for a living"), her father quotes Oscar Wilde's famous epigram that women are "meant to be loved, not to be understood." "And I nodded," Eva thinks, "although it seemed to me that I was going to be a woman too and I would like it if someone thought they should understand me." The book is Eva's, really: her struggle to allow herself to be understood. Bloom spins the story through alternating perspectives, relying heavily (maybe, a little too heavily) on brilliant letters sent and unsent, received and lost, from Iris and Gus to Eva. But whoever is telling the story, there is not a faltering sentence to be found in these pages. Especially enchanting is Bloom's light touch with the emotions, conflicts, and dramas of her characters' lives. The book often demands its reader to pay attention, to fill in the gaps—though the gaps are never too large and the demands never too stringent—eventually rewarding our diligence with a much more satisfying read than that provided by so much overwrought modern fiction. "Lucky Us" has been fine-tuned, in other words, but it doesn't feel like it. Bloom, a cousin of literary scholar Harold Bloom, has heralded novels, short story collections, and other writings to her name. "Lucky Us" proves that as readers we are very fortunate to have her writing fiction, especially; by capturing a world that has escaped most authors' attention, this understated novel may be one of the best I've read all year.